PRESIDENT Mnangagwa yesterday met Estonian President Kersti Kaljulaid and the two leaders discussed economic cooperation. Estonia is arguably the most digital society in the world as the former Soviet republic launched electronic governance in 1997, digital ID in 1999 and electronic tax in 2000. E-governance enabled Estonia to improve the competitiveness of the state and the well-being of its people. President Mnangagwa and President Kaljulaid met in Addis Ababa, Ethiopia, after attending the official opening of the 32nd Ordinary Session of the African Union Assembly and two leaders had talks on bilateral cooperation and opportunities in the field of digital technologies. President Mnangagwa’s closed door meeting with President Kaljulaid lasted close to an hour. President Kaljulaid described the engagement as very fruitful. “First, he gave me the overall economic development of your country and we have to say it was wonderful to hear about very concrete plans and we tried to see how Estonian experience in digital development could match with what you are doing in your country. Estonia is a country where public services are fully digital. You cannot get married online but everything else in online” she said. President Kaljulaid said Estonian companies had already visited Zimbabwe to explore potential areas of investment and cooperation. “Our companies have already been to your country and our ambassador as well as been to your country already looking for ways to cooperate and to develop digital services in your country. I think we found a lot of interesting information about each other’s country and we agreed we need to continue to cooperate. In our case we are a small country but we have embraced digital technologies because it is just effective and productive to do things online,” she said. 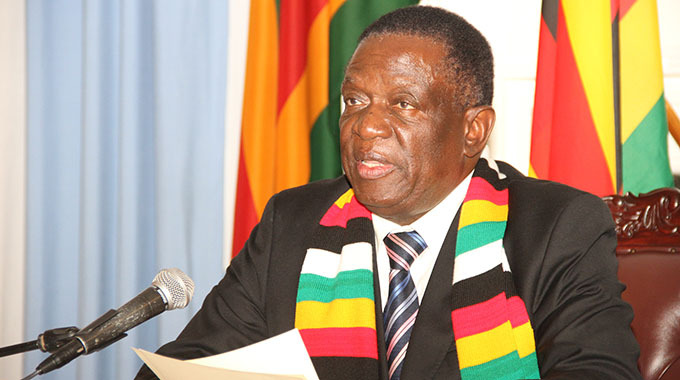 Foreign Affairs and International Trade Minister Sibusiso Moyo, who also attended the meeting, said President Kaljulaid wanted to find out more information on Zimbabwe when she paid a courtesy call on President Mnangagwa. “The President of Estonia made a courtesy call on His Excellency and her desire was to find out more about Zimbabwe’s challenges and Zimbabwe’s needs and in that regard, she was then given a very detailed background of the history of Zimbabwe’s economy for the past two decades up to today. “We are a country which is grappling with its economic emancipation without lines of credit and without any balance of payments support. As a result of that, she then made a commitment because they are specialists in digital services. In Estonia everything is digital. You register a baby birth, everything else automates to give a number, to give a health certificate and right across. It is integrated between the private sector and Government. They are one of the countries who have pioneered outside Bill Gates’ Microsoft and also developed the other side of things which is cyber security because as you develop technologically you have got this threat of cyber. They have moved with these two simultaneously. It was a good discussion,” said Minister Moyo.